Our first Islamic lecture for this year by Br. Abdulmannan Mulla was very successful Alhmdulelah. The event was held to commemorate the “Israa & Miraj (night journey of the Prophet Peace Be Upon Him)” and to prepare us for the spiritual journey towards the month of Ramadan. Many families got together for this occasion and shared a Community dinner before listening to the lecture. Br. 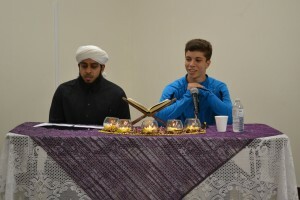 Abdulmannan’s talk was very engaging for the youth and the young at heart. His talk touched on the many difficulties that Prophet Muhammad, Peace Be Upon Him, encountered before the journey, the importance of patience in life, and the gift that the Prophet, Peace Be Upon Him, received during his night journey which was “The Salat”, the five times prayers. May Allah, (Subhano Wata’ala) reward Br. Abdulmannan the best for his enlightening words. We hope to have him over more often Insha-Allah. We look forward to having many more events in the future to nourish our minds and souls with Islamic knowledge and spiritual sustenance. Say: "If Ar-Rahman had a son I would have been the first of worshippers."